Unique chance to walk on both wild and renovated Great Wall. 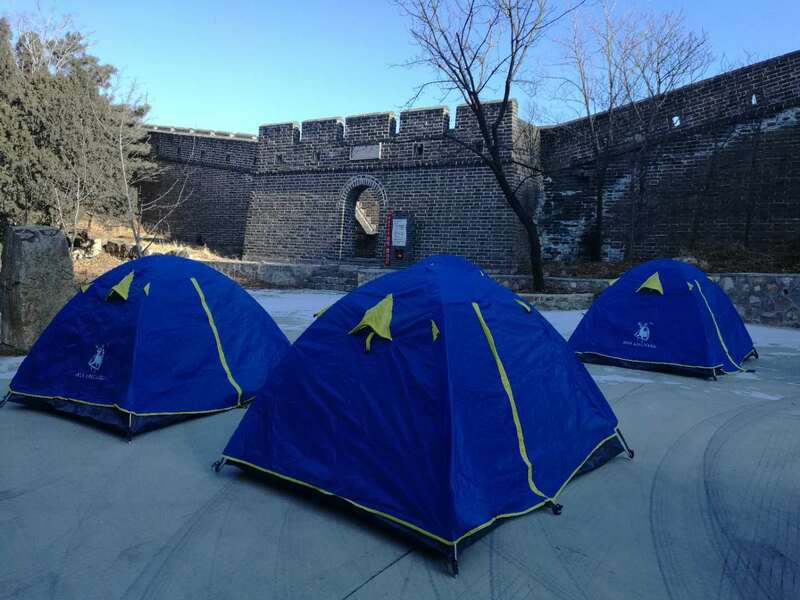 Spend overnight at the Camp site just 5 meters from the Wall. Materialize if over 10 person sign up. less than 10 person we will cancel the trip and inform you 6 days before departure. Registration deadline: 7 days before departure. What’s included: Air-con bus transfer from Beijing to Huangyaguan and vice versa, Englilsh speaking tour guide, local villager guides the hiking from Hongshimen to Qinglongbei, dinner on Saturday evening and Chinese breakfast on Sunday morning, multi-entry tickets to the Huangyaguan Great Wall, camping site cost, tent, moisture-proof pad, inflatable mat, camp lamp. Use Wechat or Alipay to search 18910905709 to add me as your friend, then you can register and pay. Dealine is April 7. We will send you a voucher after you have registered and paid. You can also send an email to info@trio-events.com to register. 10 am: start 3 hours hiking along the wild Great Wall built in the 6th century, bus transfer to Huangyaguan Great Wall. Lunch is not included, please bring your own food. In the afternoon you can walk on the Wall renovated in 1990, after you are on the Wall we suggest you walk to the west (left) since tomorrow morning you will have the chance to walk the east part. 4 pm:10 minutes bus transfer to camp site. 6 pm: Dinner at a farmer-runned guesthouse. 8 am: Local Chinese breakfast bring up to the camp site by local farmer. 9 am: Start about 2 hours walking on the Wall from the camp site to Zheng Guan. Lunch is not included, but there are many restaurants around the parking lot at Zheng Guan. 1 pm: Bus transfer back to the pick up point in Beijing.